Have you ever wondered how your app is performing in the e-conomic ecosystem? Well, now you can find out. We have received multiple requests from our app partners to provide insights on their apps. This has led us to create a new Partner API in our portfolio, which offers a completely new approach to providing insights to our app partners. Currently, we provide the ability to view the number of agreements that have granted access to your app, as well as identify when the access was granted and revoked. This allows you to see how your app is being used over time, and also track how users react to the changes you make to your integration. In the future, we will be able to provide insights about app usage rates, errors reported by your app, and much more. All of this to provide greater insights to you and in consequence help you build higher quality integrations. With webhooks you can synchronize data between your app and e-conomic in real time, without having to ask for the data in pre-defined time intervals as you would with regular API calls. However, setting up a robust and powerful webhook consumer can be a challenging task, especially if you are new to the area of consuming data in real time. Now help is here: We have created a step-by-step guide that allows you to a robust service for consuming webhooks using powerful tools such as RabbitMQ and components available in Azure. If you're new to webhooks in e-conomic, you can take a look at our introduction page that also lists our supported webhook types. What's next on the API roadmap? This year we have made our API roadmap publicly available for all our partners to make your work and planning easier in relation to your apps. 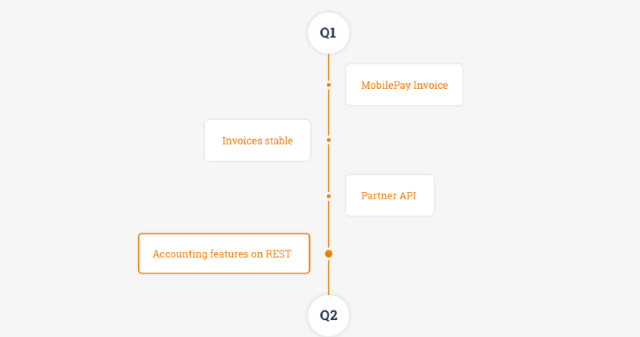 The last item on the roadmap for Q1 is accounting capabilities in REST, meaning that interactions with entries and journals will be possible very soon (i.e., the REST equivalent of Cashbook_* and CashBookEntry_* in SOAP). At the moment we are preparing for tests together with our beta testers, and once we're sure that everything looks fine we will release the new endpoint in an experimental version for a broader audience. Stay tuned and keep an eye on our TechTalk blog and Twitter feed for more news about it. Since Q2 is approaching soon, we will start working on providing the ability to book EAN invoices. If you would like to help test this or other upcoming functionality, please contact our API support and let us know. We would really appreciate beta testers for all our upcoming endpoints.